Usually, after a rest day, I'm more than ready to get back outside for a run. Today was one of those near perfect running days with plenty of sun. The temperature was warm enough for shorts yet cool and dry enough to keep sweating to a minimum. Despite all these positive conditions, I found myself unmotivated. My half marathon training schedule only required a 3 mile race-pace run today, yet I was mentally unready to do it. I didn't sleep well last night, and that probably explained the lack of drive I was feeling this morning. I didn't consider skipping today's workout, but time kept slipping by. We had people coming over in the early afternoon and I needed to get my run completed in time to shower and finish lunch. I decided to dial back the intensity and just do my mileage at whatever speed I could sustain. That got me out the door. I set a pace that felt sustainable and changed up my route to keep it interesting. While I consciously avoided focusing on speed, I did successfully keep my cadence within my targeted range. I ended up running three minutes longer than I would have if I'd followed the race-pace plan. 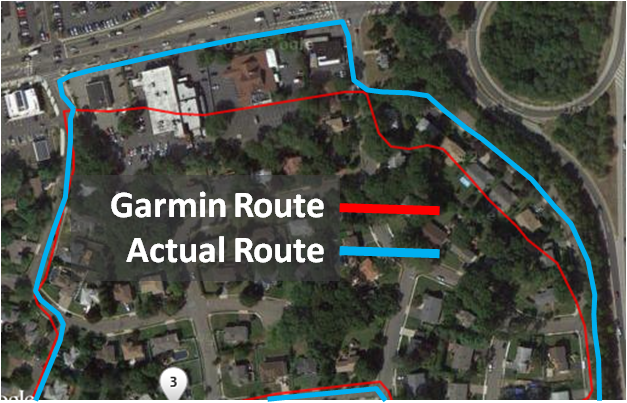 Although the skies were clear and sunny, my Garmin did a poor job of tracking my progress today (see comparison above). Further, I had no way to gauge my actual performance while I was running, because the readout was based on flawed data. Tomorrow I'm due to run 8 or nine miles. I may participate in the GLIRC Clubhouse run in the morning if I feel up to it. Otherwise I'll probably head to Bethpage a little later and do it on my own. I was going to do 12 miles at Bethpage tomorrow, but I may not go that far.. my speed work was the pits today. I may see you there. I don't want to hold you back like last Sunday. There is no way that you would hold me back. I'll look for you on the trail. I'll decide in the morning how early I'll go and whether I'll start with the GLIRC run.